Manchester United’s team selection this afternoon for their important game away to Burnley has not gone down at all well with these Man Utd fans. Plenty of Red Devils supporters were tweeting earlier about Andreas Pereira as he was rumoured to be out of the squad today, and he has indeed failed to even make the bench. United have gone with a midfield three of Paul Pogba, Nemanja Matic and Marouane Fellaini – and it’s the latter that seems to be causing the most distress among fans on Twitter at the moment. MUFC badly need to improve on Monday night’s horror-show against Tottenham, as they lost 3-0 at home to the north Londoners. 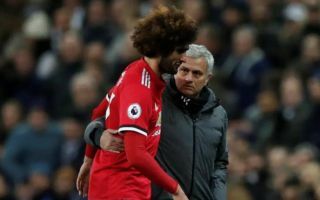 Jose Mourinho, however, has arguably gone for a pretty defensive-minded midfield by going for Fellaini over someone like Pereira or Ander Herrera. When Jose is in trouble the first man he calls up is Fellaini. These are the actions of a man who has no idea of how to play football if it doesn’t involve pinging a ball to a big guy’s head. He’s done out here. And then Fellaini starts? Is Jose insane! Wow!